The Quilt Block Trail of Western North Carolina is coming to Henderson County. There are currently six contiguous counties that host quilt blocks with the highest concentration on display being in Yancey and Mitchell Counties, over 200 between them. The quilt blocks are hand painted on a separate piece of wood and designed to be hung outside on barns and buildings in the participating communities. Each square is vividly painted and tells a story by its pattern name, history of the land, the building of the family. 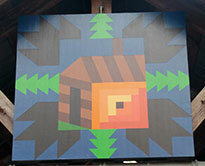 The Quilt Block Trails project started in Ohio when Donna Sue Groves put a block on her barn to honor her mother. From that simple act, the project has spread to 30 states and Canada. The Henderson County Tourism Development Authority is spearheading the project in Henderson County. Our Quilt Block Trail will draw visitors from outside Henderson County, and encourage overnight stays, thus stimulating spending and boosting the local economy. 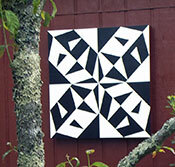 The Quilt Block Trails of Western North Carolina is a non-profit corporation. For information on purchasing a quilt block or to learn more about the trail, call the Visitors Center, (828) 693-9708.